iStockphoto just released their Getty Images sales and you should be able to download them. In case you don’t know, there are a few nice things you can see in Stock Performer. Here a quick summary for you! Start off by downloading all your iStock/Getty sales. Press on the button “iStock/Getty” button on the left. If you have an Eagle membership, go to the collections view and download your collections. All charts have a iStock/Getty filter. Press it to just see Getty sales! Our Top Sales feature also shows you your top sales on Getty. Use it to see what works well on Getty and produce more such content! If you have defined collections, then Stock Performer will break them into iStock and Getty sales. Like that you can see specifically how a collection works on Getty! 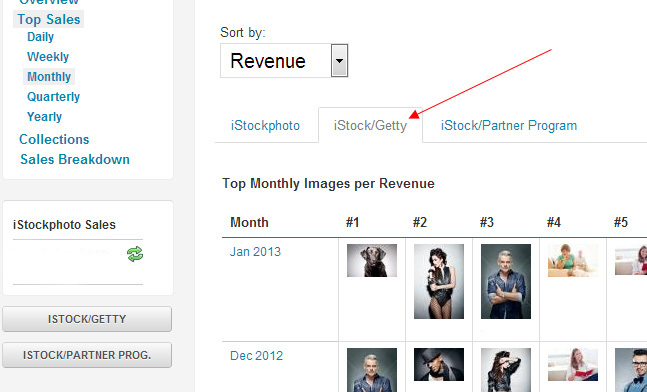 If you use the Search option, you can easily compare iStock and Getty sales. Here is an example for my Library Shooting.